February is African American History month. It is a time when we pay tribute to generations of African Americans who struggled with adversity to secure equal opportunities in America. It is a time when we recognize that although we are all different, we are really all similar, too. There are many ways to celebrate in school, with family and with non-profit organizations. • Learn about the extraordinary accomplishments of 10 African-Americans. 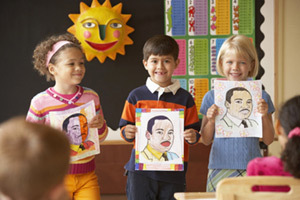 Download quizzes and coloring pages for kids that focus on African Americans. • Read articles about the historic struggle for civil rights. • Put on a play such as The Color Purple or Uncle Tom's Cabin and invite family members to come watch. 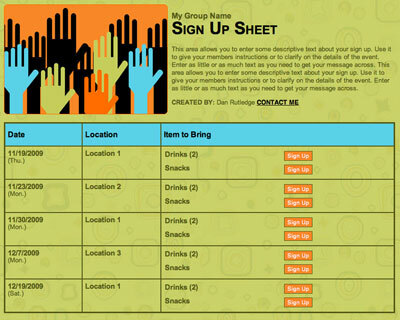 Use SignUpGenius to organize the event. • Pick one African American to focus on and learn about his/her life. • Read and study literature by African Americans. • Draw a timeline of the modern Civil Rights movement. • Have students go online to study an African-American historical figure, then dress up as their subject, adding an identifying name tag. Invite visitors, using SignUpGenius, to your “wax museum” to press imaginary buttons and bring the statues to life! • Wow your class with stats about Jesse Owens, the first American in Olympic track and field history to win four gold medals in a single Olympics. • Take an interactive trip on the Underground Railroad. Read Fannie Moore's personal story and answer the questions about what it might have been like to be in her shoes. Kids can also write letters using the secret code of the escaped slaves. • Visit local museums. It's likely that February's premier exhibits will focus on the work of black creators. • Have a dinner party and serve food with its roots in Africa and the black kitchens of the American South. You'll find recipes in dozens of Southern and African-American cookbooks. 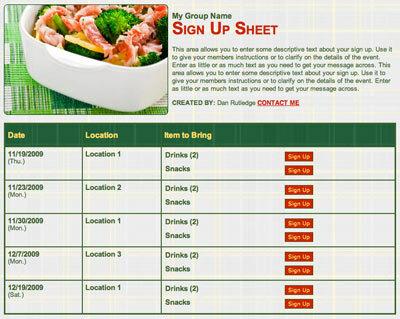 SignUpGenius will help you plan, invite and put on the party! • Sit back, relax and listen to some good, classic jazz. Or go to a jazz concert. Enjoy African American music from the past from Duke Ellington, Zora Neale Hurston, Ethel Waters, and Langston Hughes. • Read a book together or watch a movie about the story of Jackie Robinson, the first African American to play major league baseball. • Join the celebration. Visit cities and towns that enjoy festive cultural celebrations during this month. Plan a visit to historical African American landmarks. • Talk to your kids about diversity and racism. Ask them if they see it in their school and how they feel about it. What can they do to fight it? • Study your own family's history and help them see that we all come from another country and culture. • Head to the library to check out a few books about African American adventures or biographies. • Patronize a black-owned business. • Check with the Boys & Girls Clubs, YMCA or any other kids' non-profit to see what they are doing to celebrate the month. • Go with a friend to a predominantly African American church and talk with your kids about the experience. How was it different from their usual experience in a church? • Volunteer in a predominantly African American community under the leadership of a local non-profit who serves in the area. Sometimes just a simple actitivy can make a big impact. Choose one or several ideas for your family or classroom and celebrate our freedoms as Americans. Wow , using this for church lunches each Sunday. I love love it. Makes life so much easier..Thank you to the one who made this site.. 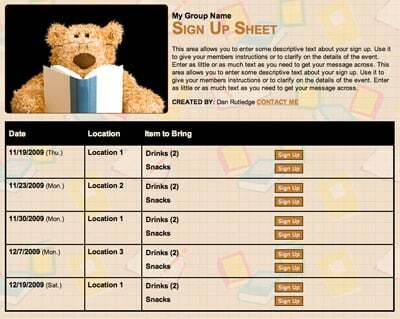 Create a Parent Teacher Conference Sign Up Now!